By the nature of their application, tappet wrenches need to have small thin heads, and this places a great deal of stress on the tools. These wrenches require very strong steel, and so tappet wrenches were one of the first applications for alloy steels. Vlchek's standard alloy for tappet wrenches was chrome molybdenum steel, and the catalogs continued to specify chrome molybdenum steel for tappet wrenches as late as 1952. The next several figures show examples of Vlchek's 9x series of tappet wrenches in the parabolic head style. Fig. 41. Vlchek 90 7/16x1/2 Tappet Wrench, ca. Late 1920s to Mid 1930s. Fig. 41 shows a Vlchek model 90 7/16x1/2 tappet wrench, stamped "Chrome Molybdenum" and "Vlchek" on the face. The overall length is 8.1 inches, and the finish is a nickel plating with a rather rough surface. Fig. 42. Vlchek 92 1/2x9/16 Tappet Wrench, ca. Late 1920s to Mid 1930s. Fig. 42 shows an earlier Vlchek model 92 1/2x9/16 tappet wrench, stamped "Chrome Molybdenum" and "Vlchek" on the face. Fig. 43. Vlchek 93 5/8x11/16 Tappet Wrench, ca. Late 1920s to Mid 1930s. Fig. 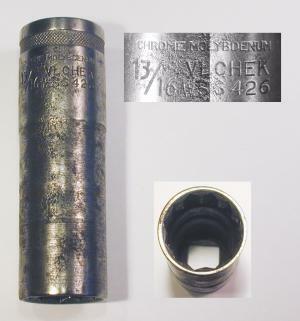 43 shows a Vlchek model 93 5/8x11/16 tappet wrench, stamped "Chrome Molybdenum" and "Vlchek" on the face. The next several figures show examples of Vlchek's 9x series of tappet wrenches in the standard head style. This style was produced from the mid 1930s onward. By 1949 (or earlier) the 9x series had been extended to include a model 89 wrench, as illustrated in the next figure. Fig. 44. Vlchek 89 3/8x7/16 Tappet Wrench, ca. Mid 1950s to Early 1960s. Fig. 44 shows a later Vlchek model 89 3/8x7/16 tappet wrench, stamped "Alloy" and "Made in U.S.A." on the shank. The overall length is 8.1 inches, and the finish is a bright chrome plate. The "Alloy" marking suggests production in the mid 1950s or later. Fig. 45. Vlchek 90A 7/16x17/32 Tappet Wrench. ca. Mid 1950s to Early 1960s. Fig. 45 shows a later Vlchek 90A 7/16x17/32 tappet wrench, stamped "Alloy" and "U.S.A." on the shank. The shank also has a forged-in code "2" on the reverse side (not shown). The overall length is 8.1 inches, and the finish is chrome plating with polished faces. Fig. 46. Vlchek 92 1/2x9/16 Tappet Wrench, ca. Mid 1930s to Mid 1950s. Fig. 46 shows a later Vlchek 92 tappet wrench, stamped "Made in U.S.A." on the face with "Chrome Molybdenum" on the shank. The shank also has a forged-in code "7" visible at the left. The overall length is 8.0 inches. The finish is chrome plating, with losses due to wear and rust. Fig. 47. Vlchek 93 5/8x11/16 Tappet Wrench, with Inset for Reverse, ca. Mid 1930s to Mid 1950s. Fig. 47 shows a later Vlchek model 93 5/8x11/16 tappet wrench, stamped "Chrome Molybdenum" and "Made in U.S.A." on the shank. The reverse shank has a forged-in code "13" visible at the left. The next two figures show examples of the Vlchek 94 tappet wrench. Fig. 48. Vlchek 94 3/4x7/8 Tappet Wrench, ca. Mid 1930s to Mid 1950s. Fig. 48 shows a Vlchek 94 3/4x7/8 tappet wrench, stamped "Vlchek" and "Made in U.S.A." on the face, with "Chrome Molybdenum" on the shank. The shank also has a forged-in code "3" visible at the left. The overall length is 8.3 inches, and the finish is nickel plating. Fig. 49. Vlchek 94 3/4x7/8 Tappet Wrench, ca. Mid 1930s to Mid 1950s. Fig. 49 shows another example of the Vlchek 94 3/4x7/8 tappet wrench, stamped "Vlchek" on the face, with "Chrome Molybdenum" and "Made in U.S.A." on the shank. The shank also has a forged-in code "4" visible at the left. The finish is a more refined chrome plate with polished heads. The overall length is 8.1 inches. In addition to the Vlchek 9x series of tappet wrenches, the company also produced other styles of tappet wrenches as contract production or special tools. Fig. 50. Vlchek 11/16x11/16 Tappet Wrench, with Inset for Reverse Detail, ca. 1920s to Early 1930s. Fig. 50 shows an early Vlchek 11/16x11/16 tappet wrench, marked with "Forged by Vlchek" forged into the shank, with "Chrome Molybdenum" forged into the reverse. The reverse shank also has forged-in number "1" (not shown). This wrench is unusual in that both openings have the same size and the same offset angle. The forged-in markings suggest earlier production from the 1920s or early 1930s. This next figure shows a Vlchek tappet wrench believed to have been produced for Caterpillar. Fig. 51. Vlchek 1A1442 9/16x9/16 Tappet Wrench. Fig. 51 shows a Vlchek 1A1442 9/16x9/16 tappet wrench, stamped "Vlchek" on the shank. The shank also has a forged-in number "7" visible at the right. The wrench appears to be made of alloy steel despite the lack of markings to that effect; the metal is not as hard as would be expected for carbon steel construction. This wrench has two openings of the same size but with one offset at a 22.5 degree angle, an early style also used by Bonney and Blue Point tappet wrenches. Later Vlchek tappet wrenches used a different design, with two different opening sizes at 15 degree offset angles. One of our readers has confirmed that this tappet wrench is marked with a Caterpillar part number, and so presumably was made for Caterpillar. We'll provide more information on the specific application when available. Vlchek Tool offered a wide selection of alloy steel open-end wrenches, in both industry-standard sizes and in their own W-series sizes. Based on a review of the catalogs, Vlchek offered open-end wrenches in two basic designs, an earlier style from the 1920s with larger "parabolic" heads, and a later style with smaller heads and narrower shanks, first produced in the early 1930s as Vlchek's W-series wrenches. These two design groups in turn were produced with a number of variations. For example, the parabolic-head wrenches were actually produced in two model number series, one with the plain industry model number (e.g. "33C"), and the other with a 1000 prefix to the industry number (e.g. "1033C"). In both cases the wrenches were stamped "Chrome Molybdenum" or "Alloy Steel" on the face. In addition, some wrenches were marked with a 2000 prefix to the model number, possibly as contract production for Western Auto Supply. As another example, the design for the W-series wrenches was also used for a line of alloy-steel wrenches marked with "pure" industry-standard numbers, sometimes stamped "Chrome-Molybdenum" and sometimes with "Alloy Steel". In the following figures we'll try to sort out these variations and show examples of the various types. 1930 Catalog Listing for Vlchek "Parabolic" Wrenches. By the late 1920s Vlchek was offering open-end wrenches with a "Parabolic" head design in chrome-molybdenum alloy steel. The scan at the left shows a catalog listing for these wrenches, as found on page 91 of the 1930 Western Auto Supply (Western edition) catalog. The catalog lists the wrenches with industry-standard numbers offset by 1000, a typical model number for an alloy-steel open-end wrench. However, Vlchek sometimes produced the same chrome-molybdenum parabolic wrenches without the offset number, or with an offset by 2000. We are fortunate to have a number of examples of these "Parabolic" wrenches displayed in the following figures. Fig. 52. Vlchek 1723 3/8x7/16 Open-End Wrench, with Inset for Reverse Detail, ca. Mid 1920s to Early 1930s. The overall length is 4.1 inches. The finish is nickel plating, but with extensive losses due to rust and wear. Fig. 53. Vlchek 1023 "Parabolic" 13/32x1/2 Open-End Wrench, ca. Mid 1920s to Early 1930s. Fig. 53 shows a Vlchek 1023 13/32x1/2 open-end wrench, a somewhat unusual size, stamped "Chrome Molybdenum" on the face. The overall length is 4.1 inches, and the finish is nickel plating with polished faces. The next figure shows a less common example of a Parabolic Style wrench with a 2000 offset to the ISN model number. Fig. 54. Vlchek 2023 13/32x1/2 Open-End Wrench. Fig. 54 shows a Vlchek 2023 13/32x1/2 open-end wrench, stamped with "Chrome Molybdenum" and "Vlchek" on the face. Fig. 55. Vlchek 1725 "Parabolic" 7/16x1/2 Open-End Wrench, ca. Mid 1920s to Early 1930s. Fig. 55 shows a Vlchek 1725 7/16x1/2 open-end wrench, stamped "Chrome Molybdenum" on one face with the model number on the other end. The overall length is 5.1 inches. The original finish was nickel plating, but most has been lost due to rust and wear. Fig. 56. Vlchek 1725B "Parabolic" 1/2x9/16 Open-End Wrench, with Inset for Reverse Detail, ca. Mid 1920s to Early 1930s. Fig. 56 shows a Vlchek 1725B 1/2x9/16 open-end wrench, stamped "Chrome Molybdenum" on one face with the model number on the other end. The shank has forged-in markings "Made in U.S.A." on one side, with "Drop Forged" on the reverse. Fig. 57. Vlchek 1025 "Parabolic" 1/2x19/32 Open-End Wrench, ca. Mid 1920s to Early 1930s. Fig. 57 shows a Vlchek 1025 1/2x19/32 open-end wrench, stamped "Chrome Molybdenum" on one face with the model number on the other end. Fig. 58. Vlchek 1727 "Parabolic" 9/16x5/8 Open-End Wrench, with Inset for Reverse, ca. Mid 1920s to Early 1930s. Fig. 58 shows a Vlchek 1727 9/16x5/8 open-end wrench, stamped "Chrome Molybdenum" and "Vlchek" on one face, with the model number on the other face. Fig. 59A. Vlchek 27 "Parabolic" 19/32x11/16 Open-End Wrench, ca. Mid 1920s to Early 1930s. Fig. 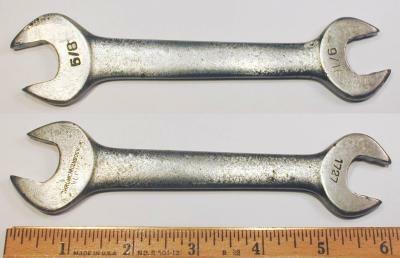 59A shows a Vlchek 27 19/32x11/16 open-end wrench in the parabolic style, stamped with "Chrome Molybdenum" and "Vlchek" on the left face, with the model number on the right face, and with the fractional sizes on the reverse faces. The overall length is 6.1 inches, and the finish is nickel plating with polished faces. Fig. 59B. Vlchek 1027 "Parabolic" 19/32x11/16 Open-End Wrench, ca. Mid 1920s to Early 1930s. Fig. 59B shows a similar Vlchek 1027 19/32x11/16 open-end wrench, stamped "Chrome Molybdenum" and "Vlchek" on one face, with the model number on the other face. Fig. 60. Vlchek 1729 "Parabolic" 5/8x3/4 Open-End Wrench, ca. Mid 1920s to Early 1930s. Fig. 60 shows a Vlchek 1729 5/8x3/4 open-end wrench, stamped "Chrome Molybdenum" on the face. Fig. 61. Vlchek 31 "Parabolic" 25/32x7/8 Open-End Wrench, ca. Mid 1920s to Early 1930s. Fig. 61 shows a Vlchek 31 25/32x7/8 open-end wrench, stamped "Chrome Molybdenum" on one face with the industry-standard model number on the other end. The overall length is 8.0 inches. The finish appears to be nickel plating, now worn through in some areas. Fig. 62. Vlchek 1731B "Parabolic" 13/16x7/8 Open-End Wrench, ca. Mid 1920s to Early 1930s. Fig. 62 shows a Vlchek 1731B 13/16x7/8 open-end wrench, stamped "Chrome Molybdenum" on the face. The overall length is 8.0 inches, and the finish is nickel plating with polished faces. 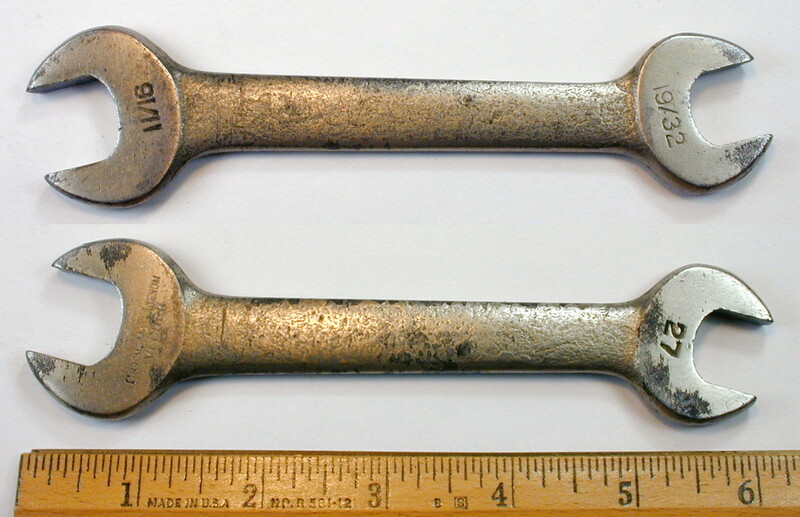 The next two figures show examples of similar 15/16x1 open-end wrenches. Fig. 63. Vlchek 33C "Parabolic" 15/16x1 Open-End Wrench, ca. Mid 1920s to Early 1930s. Fig. 63 at the left shows a Vlchek 33C 15/16x1 open-end wrench, stamped "Chrome Molybdenum" on the face. Fig. 64. Vlchek 1033C "Parabolic" 15/16x1 Open-End Wrench, ca. Mid 1920s to Early 1930s. Fig. 64 shows a Vlchek 1033C 15/16x1 open-end wrench, stamped with "Chrome Molybdenum" on the face. The overall length is 8.9 inches, and the finish is nickel plating, although badly worn in some areas. In the early 1930s Vlchek introduced a W-series line of double-ended wrenches as an alternative to its industry-standard open-end wrenches. The 1934 catalog referred to these as "The New Vlchek Double End Wrench", so we can probably assume that they were first offered around 1934. The catalog further described the wrenches as having narrow streamlined jaws, and noted a "Cadalyte" finish with buffed heads. The 1934 catalog lists the W-series wrenches in a modest selection of ten sizes, ranging from the model W1012 (5/16x3/8) up to model W3236 (1x1-1/8). As can be inferred from the examples, the model number of each wrench encodes the opening sizes in 32nds, a numbering convention that is more convenient than the older industry-standard numbers. The initial collection of W-series wrenches included no duplicates of opening sizes, so that a small number of tools could cover most of the commonly-used sizes. However, later additions to the series expanded both the range and number of size combinations. The next several figures show examples of the Vlchek W-series wrenches. Fig. 65. Vlchek W0608 3/16x1/4 Open-End Wrench. Fig. 65 shows the smallest model of the W-series wrenches, a tiny Vlchek W0608 3/16x1/4 open-end wrench with "Alloy" and "Made in U.S.A." stamped on the shank. The overall length is 3.4 inches. The original finish appears to have been cadmium plating with polished but unplated faces, but most of the plating has been lost. A faint forged-in number "10" can be seen on the left. Fig. 66. Vlchek W0810 1/4x5/16 Open-End Wrench. Fig. 66 shows another small example, a Vlchek W0810 1/4x5/16 open-end wrench. The shank is stamped "Alloy" and "Made in U.S.A.", with a forged-in number "1" visible at the left. Fig. 67. Vlchek W1012 5/16x3/8 Open-End Wrench. Fig. 67 shows a Vlchek W1012 5/16x3/8 open-end wrench, stamped "Alloy" and "Made in U.S.A." on the shank. The shank also has a forged-in number "34" visible at the left. Fig. 68. Vlchek W1416 7/16x1/2 Open-End Wrench. Fig. 68 shows a Vlchek W1416 7/16x1/2 open-end wrench, stamped "Made in U.S.A." on one face, with a forged-in number "13" visible on the shank at the left. The next two figures show examples of the Vlchek W1820 wrench. Fig. 69. Vlchek W1820 9/16x5/8 Open-End Wrench. Fig. 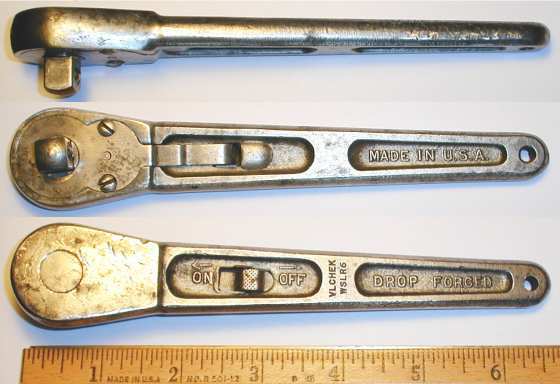 69 at the left shows a Vlchek W1820 9/16x5/8 open-end wrench, stamped "Made in U.S.A." on one face with "Alloy" on the other face. The overall length is 6.4 inches. The wrench is unfinished steel with polished ends, and has a forged-in number "42". Fig. 70. Vlchek W1820 9/16x5/8 Open-End Wrench. Fig. 70 at the left shows another Vlchek W1820 wrench, stamped "Alloy" and "Made in U.S.A." on the shank. The overall length is 6.4 inches, and the finished is plain steel with polished faces. The forged-in number is "77". The next figures show two generations of the Vlchek W2225 model. Fig. 71. Vlchek W2225 11/16x25/32 Open-End Wrench. Fig. 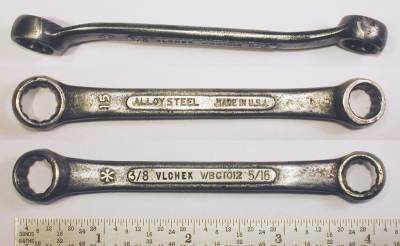 71 shows an earlier Vlchek W2225 11/16x25/32 open-end wrench, stamped "Made in U.S.A." and "Alloy" on the faces. The shank has a forged-in number "18" visible at the left. The overall length is 7.7 inches, and the finish is nickel plating. Fig. 72. Vlchek W2225 11/16x25/32 Open-End Wrench. Fig. 72 shows a later Vlchek W2225 11/16x25/32 open-end wrench, stamped "Alloy" and "Made in U.S.A." on the shank. The overall length is 7.7 inches, and the finish is plain steel with polished faces. The forged-in number is "72". Fig. 73. Vlchek W2426 3/4x13/16 Open-End Wrench. Fig. 73 at the left shows a Vlchek W2426 3/4x13/16 open-end wrench, marked "Made in U.S.A." and "Alloy". The overall length is 9.2 inches. The finish is plain steel with polished ends, and the forged-in number is "10". The next figures show two generations of the Vlchek W2526 model. Fig. 74. Vlchek W2526 25/32x13/16 Open-End Wrench. Fig. 74 shows an earlier Vlchek W2526 25/32x13/16 open-end wrench, stamped "Vlchek" and "Made in U.S.A." on one face, with "Alloy" and the model number on the other. The shank has a forged-in number "9" visible at the left. The overall length is 9.2 inches, and the finish is plain steel with traces of cadmium plating. Fig. 75. Vlchek W2526 25/32x13/16 Open-End Wrench. Fig. 75 shows a later Vlchek W2526 25/32x13/16 open-end wrench, stamped "Vlchek" and "Made in U.S.A." on one face, with "Alloy" and the model number on the other. The shank has a forged-in number "11" visible at the left. The overall length is 9.2 inches, and the finish is plain steel with polished faces. Fig. 76. Vlchek W2830 7/8x15/16 Open-End Wrench. Fig. 76 shows a Vlchek W2830 7/8x15/16 open-end wrench, stamped "Vlchek" and "Made in U.S.A." on one face, with "Alloy" and the model number on the other. The shank has a forged-in number "18" visible at the left. The overall length is 10.0 inches, and the finish is plain steel with traces of cadmium plating. Fig. 77. Vlchek W3440 1-1/16x1-1/4 Open-End Wrench. Fig. 77 shows a Vlchek W3440 1-1/16x1-1/4 open-end wrench, stamped "Made in U.S.A." on one face, with "Alloy" and the model number on the other face. The shank has a forged-in code "2" visible at the left. The overall length is 11.9 inches. and the finish is a cadmium plating. We'll close this section with a special-order wrench in the style of the W-series, but not marked with a Vlchek model number. Fig. 78. Vlchek U.S.N. 1-3/16x1-5/16 Open-End Wrench, with Inset for Marking Detail. Fig. 78 shows a Vlchek 1-3/16x1-5/16 open-end wrench, stamped "Alloy" and "Made in U.S.A." on the shank, with the Vlchek name stamped on one face (see inset) and "U.S.N." on the other face. A forged-in number "11" can be seen on the shank at the left. The unusual size and markings suggest that this was likely a military special-order tool. After the introduction of Vlchek's W-series line of double-ended wrenches, Vlchek used the same design (and probably the same forging dies) to produce a line of wrenches marked with pure industry-standard numbers, but made with (and marked as) alloy steel. These wrenches were apparently produced in large quantities, as they are among the most commonly found of the Vlchek tools. However, these wrenches were not listed in the Vlchek catalogs, strongly suggesting that the production was intended for military or industrial contracts, such as vehicle tool kits. We'll begin with two examples of the well-known 723 wrench, a size found in many tool kits. Fig. 79. Vlchek 723 3/8x7/16 Open-End Wrench. Fig. 79 shows a Vlchek 723 3/8x7/16 open-end wrench, marked "Chro-Mol Vlchek" on the face. The overall length is 4.7 inches, and the finish is plain steel. The forged-in number "14" can be seen on the shank at the left. Fig. 80. Vlchek 723 3/8x7/16 Open-End Wrench. Fig. 80 shows another example of the Vlchek 723 wrench, stamped "Alloy Steel Vlchek" on the face. The shank has a forged-in number "1" visible at the left. The next figures show several generations of the Vlchek 28-S model. Fig. 81. Vlchek 28-S 5/8x25/32 Open-End Wrench. Fig. 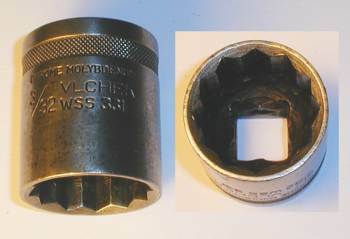 81 shows an earlier Vlchek 28-S 5/8x25/32 open-end wrench, stamped "Chrome Molybdenum" and "Vlchek" on the face. Fig. 82. Vlchek 28-S 5/8x25/32 Open-End Wrench. Fig. 82 shows a somewhat later Vlchek 28-S 5/8x25/32 open-end wrench, stamped "Alloy Steel" and "Vlchek" on the face. The overall length is 7.7 inches, and the finish is gray paint. The shank has a forged-in number "45" visible at the left. Fig. 83. Vlchek 28-S 5/8x25/32 Open-End Wrench. Fig. 83 shows a later Vlchek 28-S 5/8x25/32 open-end wrench, stamped "Alloy" and "Made in U.S.A." on the shank. The shank has a forged-in number "73" visible at the left. The overall length is 7.7 inches. The finish is a dark oxide coating, and the faces have been left unpolished, suggesting that this may have been made for a tool kit. The next two figures show examples of the 731A wrench, with differences in the finish and markings. Fig. 84. Vlchek 731A 3/4x7/8 Open-End Wrench. Fig. 84 shows a Vlchek 731A 3/4x7/8 open-end wrench, stamped "Chrome Molybdenum" on one face with the industry-standard number 731A on the other face. The shank has a forged-in number "3" visible at the left. The overall length is 9.1 inches, and the finish is nickel plating with polished faces. Fig. 85. Vlchek 731A 3/4x7/8 Open-End Wrench. Fig. 85 shows another example of the Vlchek 731A 3/4x7/8 open-end wrench, marked "Alloy Steel" on the face. The shank has a forged-in number "31" visible at the left. Although less commonly found, Vlchek also produced miniature open-end wrenches for ignition service or other applications. Fig. 86. Vlchek WH1416 7/32x1/4 Ignition Open-End Wrench. Fig. 86 shows a Vlchek WJ1416 7/32x1/4 ignition open-end wrench, marked with just the Vlchek name, model, and fractional sizes. The overall length is 3.0 inches, and the finish is nickel plating. Our earliest catalog reference for Vlchek box-end wrenches is the 1934 catalog A-2, which offered 12-point box wrenches in a short offset WB series and long offset WBL series, plus a few specialty models. The earlier catalog No. 13 from around 1929 or 1930 doesn't list any box wrenches, so we can be reasonably sure that production of these models began in the early 1930s. Vlchek's WB and WBL series of wrenches were made with round shanks, instead of the flat shanks familiar in later production. The 1938 catalog shows box-end wrenches in three series, the WBC short 10-degree models, the WB short offset models, and the WBA long 45-degree (deep) offset models. The WBA and WBC series are shown with raised panels at this time. By 1952 (actually probably well before) the more familiar long offset WBH series box wrenches had been introduced. These were first produced with raised panels but then later changed to a flat shank. Chrome alloy steel was standard for all of these wrenches, but later (by 1952) there were economy-grade wrenches offered as well. The Vlchek WBL series wrenches are relatively uncommon, but we have several examples for your viewing pleasure. Fig. 87. Vlchek WBL2022 5/8x11/16 Offset Box-End Wrench, with Insets for Side View, Reverse and Marking Detail, ca. 1931-1937. Fig. 87 shows a Vlchek WBL2022 5/8x11/16 offset box-end wrench with a round shank, stamped "Vlchek" with the model and sizes on the front, with "Chrome Molybdenum" on the reverse. The lower inset shows a close-up of the reverse marking to illustrate the taller initial letters in "Chrome Molybdenum", a stylistic trait that helps identify Vlchek production. The overall length is 9.8 inches, and the finish is plain steel, with pitting due to rust. The middle inset shows a side view of the wrench, illustrating the round shank and rugged construction. Another detail to note is that the Vlchek design provides both an offset and an angle to the box end. Other manufacturers typically produced either angled box ends with no offsets, or offset box ends with the plane of the box parallel to the shank. Fig. 88. Vlchek WBL2425 3/4x25/32 Offset Box-End Wrench, with Insets for Side View and Detail, ca. 1931-1937. Fig. 89 shows a Vlchek WBL2425 3/4x25/32 offset box-end wrench, marked "Chrome Molybdenum" on the reverse. The top inset shows a side view of the wrench, illustrating the round shank and rugged construction. Fig. 89. Vlchek WBL2628 13/16x7/8 Offset Box-End Wrench, with Insets for Side View and Detail, ca. 1931-1937. Fig. 89 shows another example of the WBL series, a Vlchek WBL2628 13/16x7/8 offset box-end wrench, stamped "Chrome Molybdenum" on the reverse. The overall length is 12.6 inches, and the finish is cadmium plating with polished ends. The next two figures show examples of Vlchek single-offset box wrenches. Fig. 90. Vlchek WB18 9/16x9/16 Single-Offset Box Wrench, with Insets for Side View and Marking Detail, ca. 1930s. Fig. 90 shows a Vlchek WB18 9/16x9/16 single-offset box wrench, stamped with "Vlchek" and the model number on the shank, with "Chrome Molybdenum" on the reverse. Fig. 91. Vlchek 1B3036 3/4x3/4 Single-Offset Box Wrench, with Insets for Side View and Marking Detail, ca. 1930s. Fig. 91 shows a Vlchek 1B3036 3/4x3/4 single-offset box wrench, stamped with "Vlchek" and "Made in U.S.A." on the shank. The model number on this wrench suggests that it might have been contract production for Caterpiller, which often assigned models beginning with a number and letter. In addition to the early WB and WBL series, Vlchek also offered a single model in the half-moon style, as shown in our next figure. Fig. 92. Vlchek WBM1820 9/16x5/8 Halfmoon Box Wrench, with Inset for Reverse Detail, ca. 1931-1937. Fig. 92 shows a Vlchek WBM1820 9/16x5/8 halfmoon box wrench, stamped "Chrome Molybdenum" on the reverse. This wrench has a round shank as with the other early box-end wrench models. This model was listed in the 1934 catalog A-2, the only example of the half-moon style. This next figure shows a specialty wrench for adjusting brakes on Ford Models A and AA vehicles. Fig. 93. Vlchek WZ3400 7/16x1/2 Double-Square Box Wrench, with Insets for Side View and Reverse Detail, ca. 1930s. Fig. 93 shows a Vlchek WZ3400 7/16x1/2 double-square box wrench for Ford brake applications, stamped with "Chrome Molybdenum" on the reverse. The overall length is 11.0 inches, and the finish is plain steel, possibly with cadmium plating. This wrench has a round shank as with the other early box-end wrench models. Fig. 94. Vlchek WBA1214 3/8x7/16 Deep Offset Box-End Wrench, with Insets for Side View and Reverse Detail, ca. 1937 to Early 1940s. Fig. 94 shows a Vlchek WBA1214 3/8x7/16 deep offset box-end wrench with raised panels on the shank, stamped "Vlchek" with the model and fractional sizes on the front panel, with "Chrome Molybdenum" and "Made in U.S.A." on the reverse. The shank also has a forged-in code "5" visible at the left. The top inset shows a side view of the wrench, illustrating the deeply offset design. The raised panels indicate production from the late 1930s to around 1946, and the "Chrome Molybdenum" marking and chrome finish make a pre-war manufacturing date most likely, though an immediate post-war manufacturing date might be possible. Fig. 95. Vlchek WBA2425 3/4x25/32 Deep Offset Box-End Wrench, with Insets for Side View and Reverse Detail, ca. 1937 to Early 1940s. Fig. 95 shows a Vlchek WBA2425 3/4x25/32 deep offset box-end wrench with raised panels on the shank, stamped "Vlchek" with the model and fractional sizes on the front panel, with "Chrome Molybdenum" and "Made in U.S.A." on the reverse. The reverse shank also has a forged-in code "5" visible at the left. Fig. 96. Vlchek WBA2628 13/16x7/8 Deep Offset Box-End Wrench, with Inset for Side View, ca. 1942-1945. Fig. 96 shows a Vlchek WBA2628 13/16x7/8 deep offset box-end wrench with raised panels, stamped with "Vlchek" and "Alloy U.S.A." plus the model and fractional sizes on the front panel. The reverse shank also has a forged-in code "5..." (not shown). The overall length is 12.7 inches, and the finish is plain steel, with pitting due to rust. The raised panels indicate production from the late 1930s to mid 1940s, and the "Alloy" marking and plain finish suggest production during the 1942-1945 wartime years. Fig. 97. Vlchek WBA3032 15/16x1 Deep Offset Box-End Wrench, with Insets for Side View and Reverse Detail, ca. 1945-1946. Fig. 97 shows a Vlchek WBA3032 15/16x1 deep offset box-end wrench with raised panels, stamped with "Vlchek" and "Alloy U.S.A." plus the model and fractional sizes on the front panel (lower inset). The reverse shank also has a forged-in code "4" visible to the left of the panel. The overall length is 14.5 inches, and the finish is chrome plating. The raised panels indicate production from the late 1930s to around 1946, and the "Alloy" marking with a chrome plated finish suggests production during the early post-war years. Fig. 98. Vlchek WBC1012 5/16x3/8 Short Angled Box-End Wrench, with Insets for Reverse and Side View, ca. 1942-1945. Fig. 98 shows a Vlchek WBC1012 5/16x3/8 short angled box-end wrench with raised panels, stamped "Vlchek" with the model and fractional sizes on the front panel, with "Alloy Steel" and "Made in U.S.A." on the reverse panel. The shank is also marked with an asterisk on the front and a forged-in number "15" on the reverse. The next figures show two generations of the WBC1214 box wrench. Fig. 99. Vlchek WBC1214 3/8x7/16 Short Angled Box-End Wrench, with Inset for Reverse Detail, ca. 1942-1945. Fig. 99 shows a Vlchek WBC1214 3/8x7/16 short angled box-end wrench marked "Alloy Steel" and "Made in U.S.A." on the reverse. The overall length is 4.6 inches, and the finish appears to be cadmium plating. The shank of this wrench has raised panels, indicating an earlier example of production of this model. The wrench has a forged-in number "16" and a very clear asterisk mark on the opposite side. Fig. 100. Vlchek WBC1214 3/8x7/16 Short Angled Box-End Wrench, with Inset for Reverse Detail, ca. 1947 to Late 1940s. Fig. 100 shows another Vlchek WBC1214 3/8x7/16 short Angled box-end wrench, but this time with a flat shank. The shank is stamped "Vlchek" with the model and fractional sizes, with "Alloy Steel" and "Made in U.S.A." on the reverse. The reverse shank also has a forged-in number "24" visible at the left. The overall length is 4.6 inches, and the finish is plain steel with polished box ends. The flat shank was standard for the WBC series wrenches from around 1947 onward. The stamped markings on both sides suggest production before around 1950. The next figures illustrate several generations of the WBC1618 box wrench. Fig. 101. Vlchek WBC1618 1/2x9/16 Short Angled Box-End Wrench, with Insets for Side View and Reverse Detail, ca. 1937 to Early 1940s. Fig. 101 shows an earlier Vlchek WBC1618 1/2x9/16 short angled box wrench in the panelled style, stamped with the Vlchek name, model number, and sizes on one panel, with "Chrome Moly" and "Made in U.S.A." on the reverse. The reverse shank also has a forged-in number "3" visible at the left. The raised panels indicate production from the late 1930s to mid 1940s, and the "Chrome Molybdenum" marking and plated finish suggest a pre-war manufacturing date. Fig. 102. Vlchek WBC1618 1/2x9/16 Short Angled Box-End Wrench, with Inset for Reverse Detail, ca. 1942-1945. Fig. 102 shows a somewhat later Vlchek WBC1618 1/2x9/16 short angled box wrench with raised panels, stamped "Vlchek" with the model number and fractional sizes on the front panel, with "Alloy Steel" and "Made in U.S.A." on the reverse. The reverse shank also has a forged-in number "18" visible at the left. Fig. 103. Vlchek WBC1618 1/2x9/16 Short Angled Box-End Wrench, with Inset for Reverse Detail, ca. 1947 to Late 1940s. Fig. 103 shows a later Vlchek WBC1618 1/2x9/16 short angled box wrench with a flat shank, stamped "Vlchek" with the model number and fractional sizes on the front, with "Alloy Steel" and "Made in U.S.A." on the reverse. The reverse shank also has a forged-in number "33" visible at the left. The next two figures show examples of the WBC2022 box wrench. Fig. 104. Vlchek WBC2022 5/8x11/16 Short Angled Box-End Wrench, with Insets for Side View and Reverse Detail, ca. 1930s to Early 1940s. Fig. 104 shows an early Vlchek WBC2022 5/8x11/16 short angled box wrench in the panelled style, stamped with the Vlchek name, model number, and fractional sizes on the front panel, with "Chrome Moly" and "Made in U.S.A." on the reverse. This example is somewhat unusual in that it does not have a forged-in number, although the front shank does have the forged-in "asterisk" mark. Fig. 105. Vlchek WBC2022 5/8x11/16 Short Angled Box-End Wrench, with Insets for Side View and Reverse Detail, ca. 1947 to Late 1940s. Fig. 105 shows a later Vlchek WBC2022 5/8x11/16 short angled box wrench, stamped with the Vlchek name, model number, and fractional sizes on the front, with "Alloy" and "Made in U.S.A." on the reverse. The reverse shank also has a forged-in number "10" visible at the left. The WBH series of long offset box wrenches are one of Vlchek's better known tools, and these wrenches must have been very popular, if the number still available is any indication. The WBH series was introduced sometime in the mid 1940s, probably during the wartime years. These wrenches were given a hybrid design incorporating both angled box ends and a small offset, somewhere in between the WBC angled series and the WBA deep offset series. Initially the wrenches were made with raised panels, but by around 1947 were being produced with flat shanks. Chrome plated finishes were standard for these wrenches during the post-war 1940s and 1950s. However, a number of examples have been found with flat shanks and plain or cadmium finishes, suggesting that these are special orders or production for government contracts. Vlchek's preferred alloy for wrenches was chrome molybdenum steel, and this steel was probably used for the WBH series whenever permitted by availability and economic factors. During the wartime years a generic "Alloy Steel" marking was generally used, and in the post-war years some "Chrome Molybdenum" markings have been noted. However, by 1949 the catalogs had begun using a more generic "Chrome Alloy" or "Alloy" specification, suggesting that the later production was probably not marked for the specific steel. 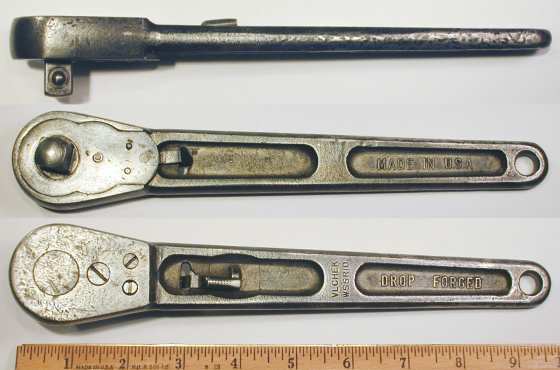 The relative scarcity of "Chrome Molybdenum" marked examples of WBH wrenches suggests that these can be attributed to the early post-war years. We'll show a number of the WBH models in the figures below, and where possible will show multiple generations of a particular model. Fig. 106. Vlchek WBH1214 3/8x7/16 Offset Box-End Wrench, with Inset for Side View, ca. 1950s to Early 1960s. Fig. 106 shows a Vlchek WBH1214 3/8x7/16 box-end wrench in the flat-shank style, stamped "Vlchek" and "Alloy U.S.A." with the model number and fractional sizes on the front, with no (stamped) markings on the reverse. The reverse has a forged-in number "12" (not shown). The overall length is 8.5 inches, and the finish is chrome plating. The top inset shows a side view of the wrench, illustrating the mix of angled and offset styles characteristic of the WBH series. The chrome plated finish and "Alloy" with markings on only one side suggest production from around 1950 onward. Fig. 107. Vlchek WBH1416 7/16x1/2 Offset Box-End Wrench, with Inset for Reverse Detail, ca. 1947-1948. Fig. 107 shows a Vlchek WBH1416 7/16x1/2 box-end wrench in the flat-shank style, stamped "Vlchek" with the model number and fractional sizes on the front, with "Chrome Molybdenum" and "Made in U.S.A." on the reverse. The reverse shank also has a forged-in number "2" visible at the left. The flat shank was standard for the WBH series from around 1947 onward, and stamped markings were placed on both sides until about 1950. 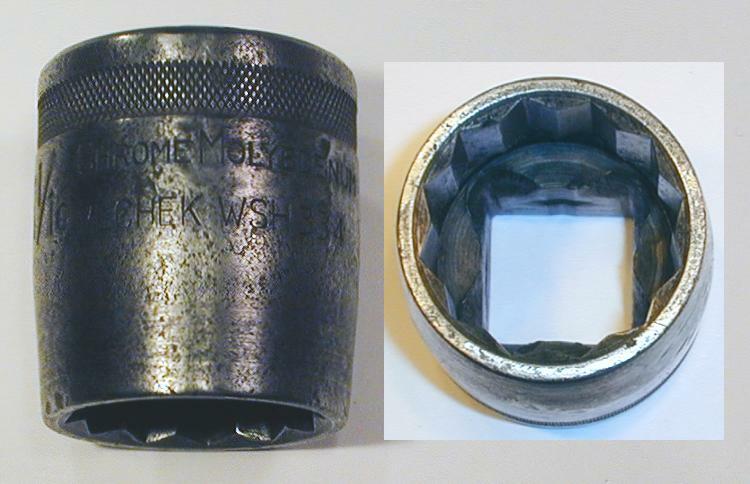 The "Chrome Molybdenum" marking on this example is uncommon for WBH-series flat-shank wrenches, suggesting production relatively early in the post-war era. Fig. 108A. Vlchek WBH1618 1/2x9/16 Offset Box-End Wrench, with Insets for Side View and Reverse Detail, ca. 1947 to Late 1940s. Fig. 108A shows a Vlchek WBH1618 1/2x9/16 offset box-end wrench with a flat shank, stamped with "Vlchek" and the model number and fractional sizes on the front, with "Alloy Steel" and "Made in U.S.A." on the reverse. The reverse shank also has a forged-in number "3" visible at the left. The flat shank was standard for the WBH series from around 1947 onward. The markings on both sides suggest production before around 1950, after which a single-sided marking style became standard. Chrome plated finishes were standard in the post-war era for civilian production, so the plain finish on this example suggests production for the military. Fig. 108B. Vlchek WBH2022 5/8x11/16 Offset Box-End Wrench, with Inset for Reverse Detail, ca. 1943-1945. Fig. 108B shows a Vlchek WBH2022 5/8x11/16 offset box-end wrench with raised panels, stamped with "Vlchek" and the model number and fractional sizes on the front panel, with "Alloy Steel" and "Made in U.S.A." on the reverse panel. The overall length is 10.0 inches, and the finish is plain steel. The box ends of the wrench have been polished but the wrench appears to have been left unplated. The raised panels and alloy steel marking suggest production during the 1943-1945 wartime years. This next figure shows an example of the WBH series in a less common size combination. Fig. 109. Vlchek WBH2024 5/8x3/4 Offset Box-End Wrench, with Insets for Side View and Reverse Detail, ca. 1947 to Late 1940s. Fig. 109 shows a Vlchek WBH2024 5/8x3/4 offset box-end wrench with a flat shank, stamped "Vlchek" with the model number and fractional sizes on the front, with "Alloy Steel" and "Made in U.S.A." on the reverse. The reverse shank also has a forged-in number "1" visible at the left. The overall length is 11.2 inches, and the finish is plain steel with polished ends. The top inset shows a side view of the wrench to illustrate the distinctive offset design. Vlchek offset wrenches used a gradual bend, giving the tools the combined characteristics of angled and offset box wrenches. The flat shank was standard for the WBH series from around 1947 onward. The marking style using both sides was used until about 1950, after which a single-sided marking style became standard. The next figures show two generations of the WBH2428 wrench. Fig. 110A. Vlchek WBH2428 3/4x7/8 Offset Box-End Wrench, with Inset for Side View and Reverse Detail, ca. 1943-1945. Fig. 110A shows an earlier Vlchek WBH2428 3/4x7/8 offset box-end wrench with raised panels, stamped "Vlchek" with the model number and fractional sizes on the front panel, with "Alloy Steel" and "Made in U.S.A." on the reverse panel. The reverse shank also has a forged-in number "4" visible at the left. The overall length is 12.3 inches, and the finish is cadmium plating steel with polished ends. The raised panels and cadmium finish suggest production during the 1943-1945 wartime years. Fig. 110B. Vlchek WBH2428 3/4x7/8 Offset Box-End Wrench, with Inset for Reverse, ca. 1947 to Late 1940s. Fig. 110B shows a later Vlchek WBH2428 3/4x7/8 offset box-end wrench with a flat shank, stamped "Vlchek" with the model number and fractional sizes on the front, with "Alloy Steel" and "Made in U.S.A." on the reverse. The reverse shank also has a forged-in number "16" visible at the left. The overall length is 12.3 inches, and the finish is plain steel with polished ends. The next figures show two generations of the model WBH2628 wrench. Fig. 111. Vlchek WBH2628 13/16x7/8 Offset Box-End Wrench, with Insets for Side View and Reverse Detail, ca. 1945-1946. Fig. 111 shows an earlier Vlchek WBH2628 13/16x7/8 offset box wrench with raised panels, stamped with "Vlchek" and the model number and fractional sizes on the front panel, with "Chrome Molybdenum" and "Made in U.S.A." on the reverse panel. The reverse shank also has a forged-in number "1" visible at the left. The overall length is 13.4 inches, and the finish is a heavy nickel or chrome plating. The raised panels, chrome molybdenum marking, and plated finish suggest production in the early postwar years of 1945-1946. Fig. 112A. Vlchek WBH2628 13/16x7/8 Offset Box-End Wrench, with Insets for Side View and Reverse Detail, ca. 1947-1948. Fig. 112A shows a somewhat later WBH2628 13/16x7/8 offset box wrench with a flat shank, stamped "Vlchek" with the model number and fractional sizes on the front, with "Chrome Molybdenum" and "Made in U.S.A." on the reverse. The reverse shank also has a forged-in number "20" visible at the left. The overall length is 13.4 inches, and the finish is nickel or chrome plating, with minor losses due to wear. Fig. 112B. Vlchek WBH2628 13/16x7/8 Offset Box-End Wrench, with Insets for Side View and Reverse Detail, ca. 1947 to Late 1940s. Fig. 112B shows a later WBH2628 13/16x7/8 offset box wrench with a flat shank, stamped "Vlchek" with the model number and fractional sizes on the front, with "Alloy Steel" and "Made in U.S.A." on the reverse. The reverse shank also has a forged-in number "12" visible at the left. The overall length is 13.4 inches, and the finish is cadmium plating. The flat shank and stamped markings on both sides suggest production from 1947 to the late 1940s. Chrome plated finishes were standard in the post-war era for civilian production, so the cadmium finish on this example suggests production for the military. The next figures show two generations of the WBH3032 model. Fig. 113A. Vlchek WBH3032 15/16x1 Inch Offset Box-End Wrench, with Insets for Side View and Reverse Detail, ca. 1943-1945. Fig. 113A shows an earlier Vlchek WBH3032 15/16x1 offset box wrench with raised panels, stamped "Vlchek" with the model number and fractional sizes on the front panel, with "Alloy Steel" and "Made in U.S.A." on the reverse panel. The forged-in number is a "6". The overall length is 15.0 inches, and the finish is cadmium plating with polished ends. The raised panels, alloy steel marking, and cadmium finish suggest production during the 1943-1945 wartime years. Fig. 113B. Vlchek WBH3032 15/16x1 Offset Box-End Wrench, with Inset for Reverse Detail, ca. 1947 to Late 1940s. Fig. 113B shows a later Vlchek WBH3032 15/16x1 offset box-end wrench with a flat shank, stamped "Vlchek" with the model number and fractional sizes on the front, with "Alloy Steel" and "Made in U.S.A." on the reverse. The reverse shank also has a forged-in number "12" visible at the left. The overall length is 14.9 inches, and the finish is plain steel with polished ends. Fig. 114. Vlchek WBH3436 1-1/16x1-1/8 Offset Box-End Wrench, with Insets for Side View and Reverse Detail, ca. 1943-1945. Fig. 114 shows a Vlchek WBH3436 1-1/16x1-1/8 offset box wrench with raised panels, stamped "Vlchek" with the model number and fractional sizes on the front panel, with "Alloy Steel" and "Made in U.S.A." on the reverse panel. The forged-in number is "4", visible at the left in the lower inset. The overall length is 16.3 inches, and the finish is cadmium plating. In case some readers were thinking that Vlchek only made small to medium-sized wrenches, the next figure shows a much larger example of the WBH series. Fig. 115. Vlchek WBH4648 1-7/16x1-1/2 Offset Box-End Wrench, with Inset for Reverse Detail, ca. 1943-1945. Fig. 115 shows a Vlchek WBH4648 1-7/16x1-1/2 offset box wrench with raised panels, stamped "Vlchek" with the model number and fractional sizes on the front panel, stamped "Alloy Steel" and "Made in U.S.A." on the reverse panel. The overall length is 19.5 inches, and the finish is plain steel with polished ends and panels. The forged-in number is "2". The raised panels, alloy steel marking, and plain finish suggest production during the 1943-1945 wartime years. This model is actually the largest of the WBH series wrenches, at least according to the 1952 catalog. Vlchek began producing combination wrenches in the late 1930s, possibly initially for the Western Auto ChromeXQuality brand. Vlchek-branded combination wrenches were not listed in the 1938 catalog A4, but probably followed soon after this date. (Combination wrenches were definitely available by 1949.) The wrenches were assigned model numbers with a WBE prefix followed by the size in 32nds, e.g. WBE24 for a 3/4 size. Combination wrenches were produced in three stylistic variations. The earliest wrenches were made with raised panels on the shank, followed by a wide flat shank, and finally by a narrow flat shank. Catalogs from 1949 and 1952 show the combination wrenches with a wide flat shank. An example of an early Vlchek combination wrench can be seen as the ChromeXQuality WBE18 Combination Wrench. Vlchek's early combination wrenches for the ChromeXQuality brand were made of chrome molybdenum steel, Vlchek's preferred alloy for that time. Later catalogs from 1949 and 1952 listed chrome alloy steel for combination wrenches, a less specific term that would allow other alloys to be used. Fig. 116. Vlchek WBE16 1/2 Combination Wrench, with Inset for Side View, ca. 1953 to Early 1960s. Fig. 116 shows a Vlchek WBE16 1/2 combination wrench with a narrow shank, stamped "Vlchek" and "Alloy U.S.A." with the model number and fractional size on the front, with no markings on the reverse. The shank also has a forged-in number "6" visible at the left. The overall length is 6.9 inches, and the finish is chrome plating, with minor losses due to rust. The inset shows a side view of the wrench, illustrating the typical Vlchek production characteristics. Note especially the relatively thin box end and the sharp grinding radii at both ends. The next figures show two generations of the Vlchek WBE18 combination wrench. Fig. 117A. Vlchek WBE18 9/16 Combination Wrench, with Inset for Reverse, ca. 1942-1945. Fig. 117A shows an earlier Vlchek WBE18 9/16 combination wrench with raised panels, stamped "Vlchek" with the model number and fractional size on the front panel, with "Alloy Steel" and "Made in U.S.A." on the reverse panel. No forged-in number was noted. The overall length is 7.5 inches. The wrench shows traces of gray paint, probably from the original finish. The paneled shank with a painted finish and alloy steel marking suggest production during the 1942-1945 wartime years. Fig. 117. Vlchek WBE18 9/16 Combination Wrench, with Inset for Reverse Detail, ca. 1947-1953. Fig. 117 shows a later Vlchek WBE18 9/16 combination wrench with a flat shank, stamped "Vlchek" with the model number and fractional size on the front, with "Chrome Alloy" and "Made in U.S.A." on the reverse. The shank also has a forged-in number "7" (faintly) visible at the left. The wide flat shank on this example suggests production from around 1947 to about 1953. The next figures show two generations of the Vlchek WBE20 combination wrench. Fig. 118A. Vlchek WBE20 5/8 Combination Wrench, with Inset for Side View, ca. 1947-1953. Fig. 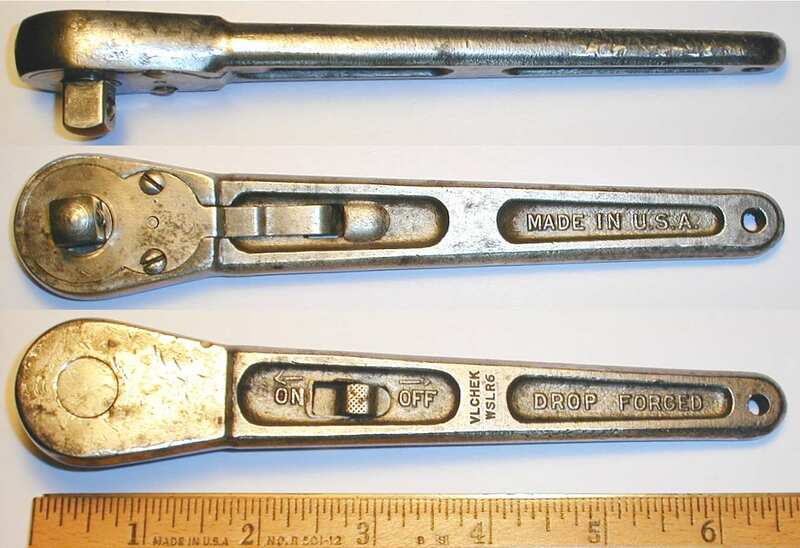 118A shows an earlier Vlchek WBE20 5/8 combination wrench with a flat shank, stamped "Vlchek" and "Alloy U.S.A." with the model number and fractional size on the front, with no markings on the reverse. The shank also has a forged-in number "6" visible at the left. The inset shows a side view of the wrench, providing a good example of Vlchek production characteristics. Note especially the relatively thin box end and the sharp grinding radii at both ends. Fig. 118B. Vlchek WBE20 5/8 Combination Wrench, with Inset for Side View, ca. 1953 to Early 1960s. Fig. 118B shows a somewhat later Vlchek WBE20 5/8 combination wrench with a narrow shank, stamped "Vlchek" and "Alloy U.S.A." with the model number and fractional size on the front, with no markings on the reverse. The shank also has a forged-in number "9" visible at the left. The top inset shows a side view of the wrench, providing a good example of Vlchek production characteristics. Note especially the relatively thin box end and the sharp grinding radii at both ends. The wrench has a narrower shank than the example in the previous figure. Based on a catalog review, the bar-type narrow shank was produced from about 1953 onward. Fig. 119. Vlchek WBE22 11/16 Combination Wrench, with Inset for Side View, ca. 1947-1953. Fig. 119 shows a Vlchek WBE22 11/16 combination wrench with a wide flat shank, stamped "Vlchek" and "Alloy U.S.A." with the model number and fractional size on the front, with no markings on the reverse. The shank also has a forged-in number "5" visible at the left. The top inset shows a side view of the wrench, illustrating the typical Vlchek production characteristics. Note especially the relatively thin box end and the sharp grinding radii at both ends. The next figures show two generations of the Vlchek WBE24 wrench. Fig. 120A. Vlchek WBE24 3/4 Combination Wrench, with Insets for Side View and Reverse Detail, ca. 1942-1945. Fig. 120A shows an earlier Vlchek WBE24 3/4 combination wrench with raised panels, stamped "Vlchek" with the model and fractional sizes on the front panel, with "Alloy Steel" and "Made in U.S.A." on the reverse panel. The shank has a forged-in number "3" visible at the left. The paneled shank with a plain finish and alloy steel marking suggest production during the 1942-1945 wartime years. Fig. 120B. Vlchek WBE24 3/4 Combination Wrench, ca. 1953 to Early 1960s. Fig. 120B shows a later Vlchek WBE24 3/4 combination wrench with a narrow shank, stamped "Vlchek" and "Alloy U.S.A." with the model number and fractional size, with no markings on the reverse. The shank also has a forged-in number "13" visible at the left. The narrow shank indicates production from 1953 onward. Fig. 120C. Vlchek WBE28 7/8 Combination Wrench, with Inset for Side View, ca. 1953 to Early 1960s. Fig. 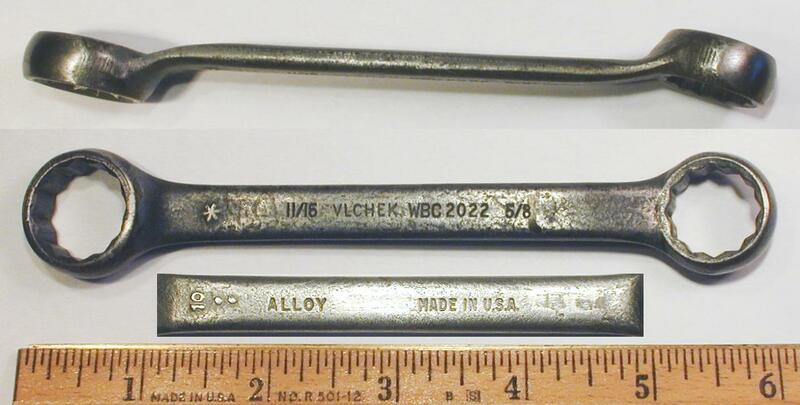 120C shows a Vlchek WBE28 7/8 combination wrench with a narrow shank, stamped "Vlchek" and "Alloy U.S.A." with the model number and fractional size, with no markings on the reverse. The shank also has a forged-in number "2" visible at the left. Fig. 120D. Vlchek WBE30 15/16 Combination Wrench, with Inset for Side View, ca. 1953 to Early 1960s. Fig. 120D shows a Vlchek WBE30 15/16 combination wrench with a narrow shank, stamped "Vlchek" and "Alloy U.S.A." with the model number and fractional size, with no markings on the reverse. The shank also has a forged-in number "3..." visible at the left. The overall length is 12.2 inches, and the finish is chrome plating, with extensive losses due to rust and wear. Fig. 120E. Vlchek WBE32 1 Inch Combination Wrench, with Inset for Side View, ca. 1953 to Early 1960s. Fig. 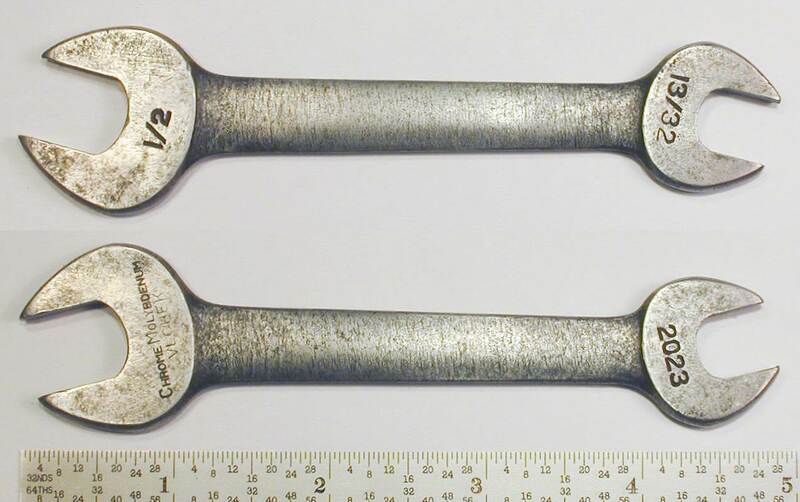 120E shows a Vlchek WBE32 1 inch combination wrench with a narrow shank, stamped "Vlchek" and "Alloy U.S.A." with the model number and fractional size, with no markings on the reverse. The shank also has a forged-in number "2.." visible at the left. The overall length is 13.2 inches, and the finish is chrome plating, with extensive losses due to rust and wear. Interchangeable sockets and drive tools were one of the most important tool-related developments of the 20th century, but for whatever reason Vlchek Tool apparently chose not to compete in this area. Except for a brief period in the early to mid 1930s, Vlchek did not produce sockets and drive tools during the decades from 1910 through the 1940s, the period that brought most of the important innovations in socket tools. The company's early production of sockets is known only from catalog A-2, published around 1934. In the mid to late 1950s Vlchek began offering sockets and drive tools regularly in their catalogs, and the 1957 Vlchek catalog offered tools in 1/4-drive up through 3/4-drive sizes. But in Vlchek's later period, most of the known examples bear a close resemblance to 1950s-era tools from Fleet and Penens, two companies in the Proto Tool family. (E.g. the 2805 Extension.) These considerations suggest that the later socket tools were most likely produced under contract manufacture, rather than developed internally. We'll look at these later socket tools in another section. Vlchek sockets and drive tools from their 1930s period are less commonly found, reflecting the fact that they were were available only for a relatively short period. We'll begin this section with a example of an early 1/2-drive Vlchek ratchet. Fig. 121. Vlchek WSSR10 1/2-Drive Reversible Ratchet, with Insets for Reverse and Side View, ca. 1934-1935. Fig. 121 shows a 1/2-drive Vlchek WSSR10 ratchet of distinctive design, marked with "Drop Forged" forged into the handle, with "Made in U.S.A." forged into the reverse. The ratchet mechanism uses a dual-pawl design with a 28-tooth drive gear. Fig. 122. Vlchek WSLR6 3/8-Drive Ratchet, with Insets for Reverse and Side View, ca. 1935. Fig. 122 shows a 3/8-drive Vlchek WSLR6 ratchet of distinctive design, marked "Drop Forged" in forged-in raised letters, with "Made in U.S.A." on the reverse. The overall length is 6.6 inches, and the finish shows some traces of the original plating, probably nickel. The most unusual feature of this ratchet is its linear slide shift lever, seen in the photograph with its "ON" and "OFF" directional arrows. The lever has a slot that slips over the pivot pin of the pawl, to maintain alignment, and an offset hole in the lever engages a pin at the top of the pawl. The sliding motion of the shifter then imparts a rotation to the pawl, and shifts it to the opposite side of the detent. Apart from the unique shift arrangement, the design of the ratchet is very similar to the pivoting pawl design developed by Snap-On in the early 1930s. (See patent #1,854,513 for more information.) The ratchet mechanism has a 20-tooth drive gear, and the pivoting pawl has a single tooth on each side. A spring-loaded detent ball returns the pawl to its selected position. Shortly after acquiring the ratchet in the above figure, we were fortunate to acquire an early Vlchek socket from another collector. 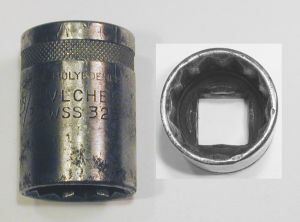 The socket appears to date from approximately the same time frame as the ratchet, early to mid 1930s, and indicates again that Vlchek at least experimented with socket production at this early time. Fig. 123. Vlchek WSS331 1/2-Drive 31/32 Socket, with Inset for Broaching, ca. 1935. Fig. 123 shows a 1/2-drive Vlchek WSS331 31/32 socket, marked "Chrome Molybdenum" with the Vlchek name. The finish is polished steel. The inset shows the broached opening, and the chatter marks on the wall indicate cold-broached manufacture. The band of finely detailed cross-hatched knurling resembles the knurling on sockets from New Britain. Another detail worth noting is that the drive end of the socket has a small recess in each wall, a convenience feature to help retain the socket on its drive stud. Although common today, this was rather uncommon in the early to mid 1930s, due to the additional work required to machine the recesses. Fig. 124. Vlchek WSS325 1/2-Drive 25/32 Socket, with Inset for Broaching, ca. 1935. Fig. 124 shows a 1/2-drive Vlchek WSS325 25/32 socket, stamped "Chrome Molybdenum" with the Vlchek name and model number. The finish is plain steel, with extensive pitting due to rust. The socket has a band of finely detailed cross-hatched knurling at the base, resembling the knurling found on sockets from New Britain. Fig. 125. Vlchek WSS426 1/2-Drive Deep 13/16 Socket, with Insets for Broaching and Marking Detail, ca. 1935. Fig. 125 shows a 1/2-drive Vlchek WSS426 deep 13/16 socket, stamped "Vlchek" with the size and model number, and with "Chrome Molybdenum" above. Fig. 126. Vlchek WSH334 3/4-Drive 1-1/16 Socket, with Inset for Broaching, ca. 1935. Fig. 126 shows a 3/4-drive Vlchek WSH334 1-1/16 socket, stamped "Chrome Molybdenum" with the Vlchek name and model. As with the previous figure, the drive end of the socket has a small recess in each wall, a convenience feature to help retain the socket on its drive stud.